Calendar: «International Nurses Day», «National Nurse Week and National Nurses Day or National RN Recognition Day». «The nurses’ job» illustrated quotation. Nurses Day, free quote pictures for Facebook, Twitter, LinkedIn, Reddit, Pinterest and other social networks. 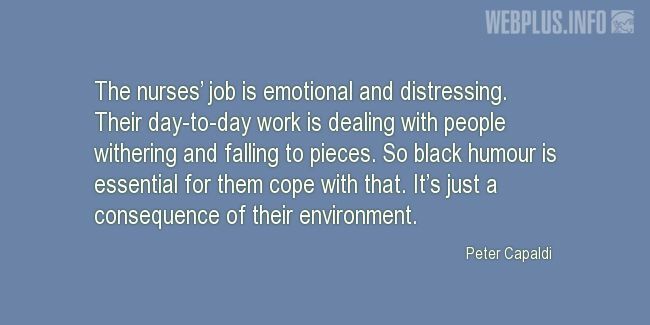 The nurses’ job is emotional and distressing. Their day-to-day work is dealing with people withering and falling to pieces. So black humour is essential for them cope with that. It’s just a consequence of their environment.